An exhibition at Tate Britain celebrates Van Gogh’s time in Britain. 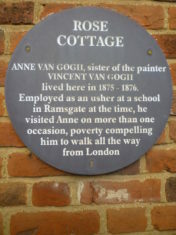 [i] He worked in Covent Garden and lived in Brixton and the Oval but he also visited Hertfordshire. Last Monday I left Ramsgate for London. That’s a long walk indeed, and when I left it was awfully hot and it remained so until the evening, when I arrived at Canterbury. That same evening I walked a bit further until I came to a couple of large beeches and elms next to a small pond, where I rested for a while. In the morning at half past 3 the birds began to sing upon seeing the morning twilight, and I continued on my way. It was good to walk then. In the afternoon I arrived at Chatham, where, in the distance, past partly flooded, low-lying meadows, with elms here and there, one sees the Thames full of ships. It’s always grey weather there, I think. There I met a cart that brought me a couple of miles further, but then the driver went into an inn and I thought he might stay there a long time, so I walked on and arrived towards evening in the well-known suburbs of London ….. But to continue: I spent one night at Mr Reid’s and the next at Mr Gladwell’s, where they were very, very kind. I wanted to leave for Welwyn that evening, but they literally held me back by force because of the pouring rain. However, when it had let up somewhat, around 4 in the morning, I set out for Welwyn. First a long walk from one end of the city to the other, something like 10 miles (each taking 20 minutes). In the afternoon at 5, I was with our sister and was very glad to see her. [i] This runs until 11 August 2019. 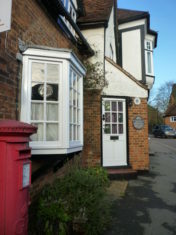 [ii] Tony Rook, Welwyn Garden City Past, Phillimore, 2001 is available through the Hertfordshire Library Service, Call number 942.586 WGC. A long walk indeed. Fascinating.